9DollarDebtEducation.com is approved to issue certificates evidencing completion of a personal financial management instructional course in compliance with the Bankruptcy Code. Approval by the U.S Department of Justice does not endorse or assure the quality of a Provider's services. IMPORTANT: it is YOUR responsibility to get your certificate to your legal counsel and/or the court of jurisdiction handling your case. 9DollarDebtEducation.com will make every effort to provide your certificate of completion to you in a timely manner. If you do not receive your certificate within 72 hours after completion of the course, 1. Check your email spam or junk mail folders and 2, contact our office immediately so that your email address and delivery can be confirmed. In rare cases, an ISP will block incoming user mail and not return any notification of such action, leaving both parties unaware that non delivery of the certificate has occured. 9DollarDebtEducation.com does not pay or receive referral fees for the referral of debtors. The services provided by 9DollarDebtEducation.com are available for free or at a reduced rate based on the debtor student's ability to pay. This applies to those individuals who's current household income is less than 150% of the income of the official poverty line as identified by the United States Department of Health and Human Services applicable to a household of the same size. 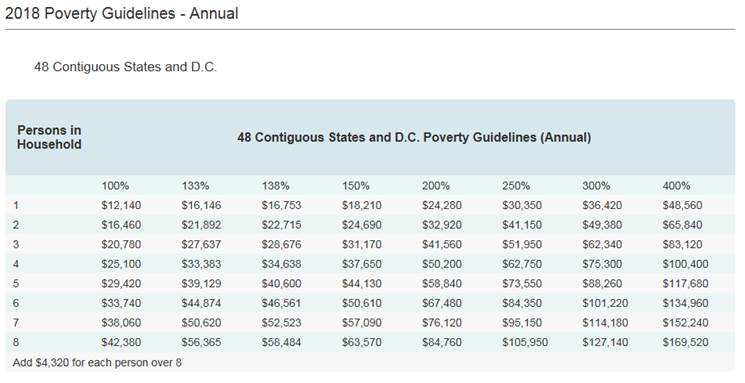 The following is a chart showing the 2018 Poverty Guidelines. If your sole source of income is from disability, or you are receiving legal services on a pro-bono basis, 9DollarDebtEducation.com will also reduce or waive the course fee. Note: same day certificate processing shall not be available for accounts with waived fees. 9DollarDebtEducation.com is available on the Internet 7 days a week, 24 hours a day, 365 days of the year. Free bilingual instruction is available through Google by visiting http://translate.google.com. This will enable full site translaton for multiple languages for better comprehension. A course instructor will be available during business hours to answer any questions that a student has when taking the course. Our regular business hours are Monday - Friday (8:00am - 5 pm PST). The course instructor holds both a Bachelor of Science degree in business administration as well as as a CHFC (Chartered Financial Consultant) certification and has been counseling individuals in personal financial management for over 20 years. It is our goal that every course participant receives the chance to re-establish financial stability within their lives and attain their goals through responsible financial habits. 9DollarDebtEducation.com will provide a certificate of course completion promptly (within 72 hours) upon completion of the course. For a certificate to be issued, the debtor must provide the Bankruptcy Case Number and the Judicial District where the bankruptcy case is filed. 9DollarDebtEducation.com may disclose debtor information to the United States Trustee in connection with the United States Trustee's oversight 9DollarDebtEducation.com at anytime. The United States Trustee has reviewed only the instructional course provided by 9DollarDebtEducation.comThe United States Trustee has neither reviewed nor approved any other services provided by 9DollarDebtEducation.com. 9DollarDebtEducation.com will only provide a certificate of completion if the debtor has met the requirements for course completion. By proceeding with the course registration your hereby agree to the above terms and release 9DollarDebtEducation.com of any liability associated with your participation of this course and in the outcome of your bankruptcy case.